The Government is serious about CSR Compliance – Are you? Corporate Social Responsibility (CSR) suggests that the responsibility of the for-profits operating within society, is to also contribute towards its economic, social and environmental development and well-being. The core objective of enforcing a CSR mandate is that businesses cannot succeed in isolation, especially when society at large fails to prosper. The Companies Act, 2013 is therefore, a landmark legislation that made India the first country to mandate and quantify CSR expenditure. This move was an attempt by the government to partner with business houses on the national development agenda. in a given financial year, must spend 2 percent (to be calculated as per Section 198 of the Act) of their average net profits on socially relevant projects as defined in Schedule VII of The Companies Act. However, even today many corporates eligible for CSR do not contribute to development projects and therefore run a risk of being sent notices for non-compliance and non-conformance of CSR norms. While a large chunk of eligible corporates have adopted the mandate as an opportunity to further their corporate citizenship and not just as a tick box activity, there is still a large share of eligible companies who are yet to deploy their CSR funds. 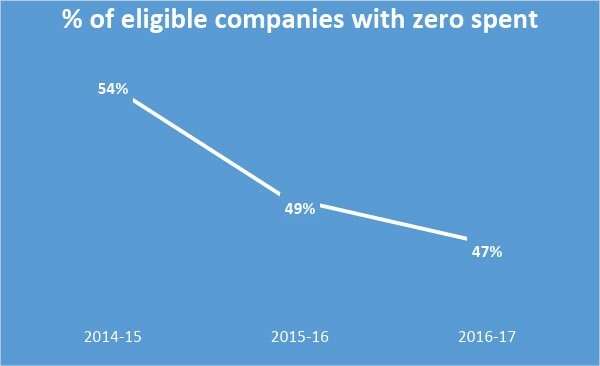 Three years after the law came into existence, that is till 2016-17 – close to half of 19,933 eligible companies have not spent any money as part of their CSR obligations (~9468 companies) and as many as 15,422 companies spent less than the prescribed CSR amount during the same period. 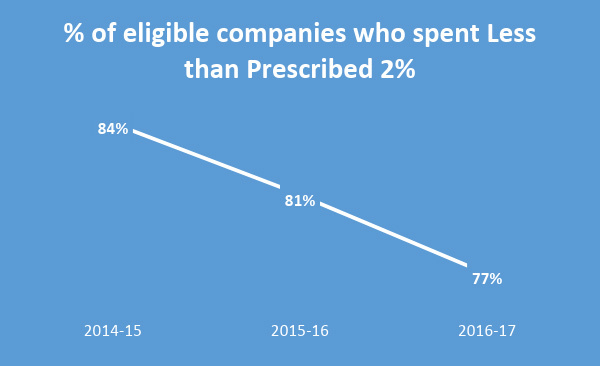 In addition to the above citations, there are examples of companies as well who have spent upwards of four times of their prescribed CSR budget in the financial year. ●	CSR compliance among these companies stood at 93% for the year 2017-18 up 2% points compared to previous year. ●	Metal, mining and mineral (138%) followed by Oil, Drilling, Lubricants and petrochemicals (104%) sectors emerged as the highest CSR compliant industries followed closely by Auto and Auto ancillaries. ●	National CSR award – The Ministry of Corporate Affairs has instituted National CSR Award (NCSRA) to recognise CSR for inclusive growth and sustainable development. This Award seeks to recognise the companies that have made a transformative impact on society. ●	Reconstitution of a high-level committee on Corporate Social Responsibility 2018 (HLC-2018) under the Chairmanship of Secretary, Ministry of Corporate Affairs (MCA) to review the existing framework and guide and formulate the roadmap for a coherent policy on Corporate Social Responsibility. ●	Centralised Scrutiny and Prosecution Mechanism (CSPM) to promote enforcement of CSR provisions. CSPM has been tasked to start with examination of records of the top 1,000 companies mandated to spend on CSR. The CSPM team of inspectors are issuing show cause notices and prosecution proceedings against non-compliant companies. In the latest round, prosecution proceedings against 284 companies and show cause notices against 5,382 companies have already been issued. In view of these efforts, it is clear that the government is serious about bringing rigour and strong scrutiny to ensure the CSR law is strictly followed in the near future. ●	Contribution to multi stakeholder platforms founded to address areas of concern. ●	Recognising CSR as a strategic corporate function : CSR law is here to stay. Recognising the strategic and legal significance of CSR and incorporating it into long-term corporate strategy is imperative. ●	CSR Vision : Alignment and long term commitment to company’s CSR anchor ( focus area/audience/geography ) is key in creating long lasting impact and corporate legacy. ●	Measure to improve, not prove: A robust monitoring and evaluation mechanism acts well as the steering wheel required to continuously improve CSR interventions and make timely course corrections. ●	Outcome first: An outcome led approach as against an input led approach goes a long way in establishing the social impact goals the corporate wants to achieve. There is a need to fund projects which will not only impact the last mile recipient of the intervention but also bring the culture of empathy and service within the organisation. Sattva has been working with various corporate clients to help them define their social impact goals and maximise the return on social investment. Our focus is to solve critical problems and find scalable solutions. Several corporates have been a partner to many such collaborations where effective CSR programmes have strategically aligned with business and have provided meaningful solutions to social issues.